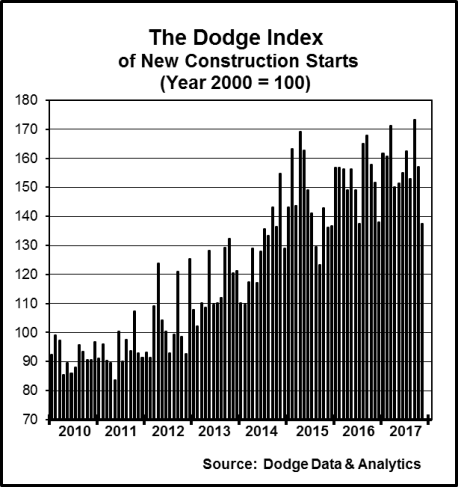 At a seasonally adjusted annual rate of $650.5 billion, new construction starts in November dropped 12% from October, according to Dodge Data & Analytics. Nonresidential building fell 14% in November, retreating for the second month in a row after the sharp improvement reported in late summer. The nonbuilding construction sector, which can be volatile on a month-to-month basis, plunged 32% in November after its 28% hike in October, which included the start of two large natural gas pipeline projects. Meanwhile, residential building managed to edge up 1% in November, as an improved amount for single family housing slightly outweighed a moderate pullback for multifamily housing. During the first eleven months of 2017, total construction starts on an unadjusted basis were $687.1 billion, up 1% from a year ago. The year-to-date increase for total construction was restrained by a 39% downturn for the electric utility/gas plant category. Excluding electric utilities and gas plants, total construction starts during the first eleven months of 2017 would be up 4% compared to last year. Nonresidential building in November was $220.1 billion (annual rate), a 14% drop on top of October’s 31% decline, which followed gains of similar magnitude in September (up 34%) and August (up 10%). The institutional building segment in November descended 13%, with an especially steep 59% plunge for the amusement category, which in October had received support from the start of the $1.1 billion retractable roof ballpark for the Texas Rangers in Arlington, Texas, and a $240 million convention center expansion in Lexington, Ky.. By contrast, the largest amusement project entered as a November start was a $66 million recreational facility replacement in Madison, Wis. Weaker activity in November was also reported for public buildings (courthouses and detention facilities), down 51%; and transportation terminals, down 22%; although November did include a $175 million terminal improvement project at San Francisco International Airport. 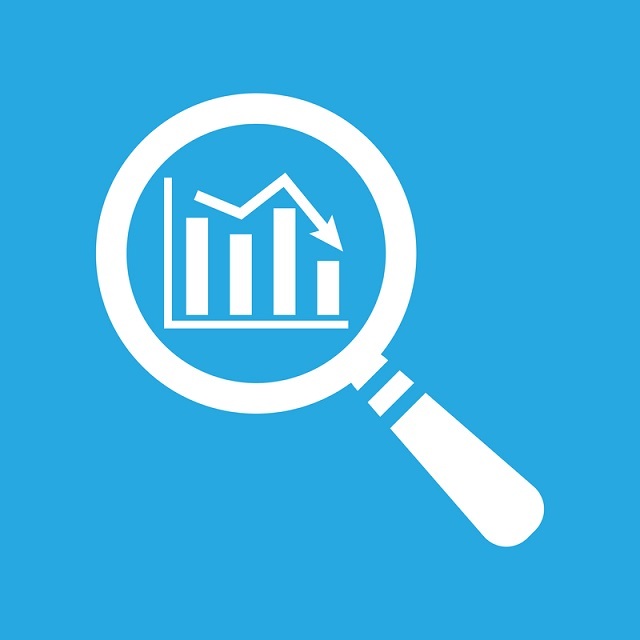 On the plus side, educational facilities climbed 12% in November, aided by groundbreaking for a $421 million research laboratory at the University of California in Merced, Calif., a $237 million research facility at the University of California in San Francisco and a $180 million corporate learning campus in Orlando, Fla. Healthcare facilities improved 4% in November, helped by the start of a $152 million hospital addition in Newark, Del., and the $150 million Oklahoma University medical center patient tower in Oklahoma City. Religious buildings also strengthened in November, rising 5%. The commercial categories as a group dropped 9% in November. Warehouse construction fell 13%, despite the November start of two Amazon fulfillment centers, located in Salem, Ore., ($90 million) and the Baltimore area ($45 million). Hotel construction was down 10% in November, even with groundbreaking for the $300 million new tower at the Palace Station hotel in Las Vegas and the $127 million Loews Hotel at the Texas Live! development in Arlington, Texas. Office construction slipped a relatively modest 3% in November, with support coming from such projects as a $219 million office tower in Camden, N.J., the $165 million Sentinel Square office building in Washington D.C., and the $153 million FBI Central Records Complex in Winchester, Va. Store construction in November was unchanged from its October amount. The manufacturing buildings category in November fell 38% from October which included a $675 million polyethylene plant and a $450 million petroleum refinery, both in Texas. The largest manufacturing projects entered as November starts were a $225 million Lockheed Martin production facility in Colorado and a $190 million upgrade to a Samsung Electronics facility in South Carolina. Through the first eleven months of 2017, nonresidential building advanced 7% compared to the same period a year ago. The institutional building group increased 14% year-to-date, led by a 127% jump for transportation terminals combined with a 7% gain for educational facilities. Additional year-to-date gains were reported for religious buildings, up 15%; and public buildings, up 4%; while the healthcare facilities category was flat and the amusement category slipped 5%. Manufacturing building year-to-date climbed 32%, reflecting a rebound for petrochemical plant starts in 2017. The commercial building group retreated 5% year-to-date, with both office buildings and hotels down 6%, while store construction dropped 11%. Warehouse construction, up 9%, was the only commercial category to register a year-to-date increase. Residential building in November was $302.1 billion (annual rate), up 1% from October. Single family housing rose 4%, showing upward movement once again after the pause experienced earlier in the year. Multifamily housing decreased 5% in November, retreating for the second month in a row as the number of very large projects that are reaching groundbreaking continues to settle back. In November, there were 6 multifamily projects valued each at $100 million or more that reached groundbreaking, led by the $199 million phase 2 of the Wanamaker Student Housing project in Philadelphia, the $177 million multifamily portion of a $200 million mixed-use building in Boston and a $150 million apartment complex in Los Angeles. The top five metropolitan markets ranked by the dollar amount of multifamily starts in November were — New York, Boston, Washington D.C., Philadelphia and Los Angeles. During the January-November period of 2017, residential building grew 2% compared to last year. Single family housing climbed 8%, providing the lift to the residential total as the result of this year-to-date regional pattern – the South Atlantic, up 12%; the South Central and the West, each up 8%; the Midwest, up 5%; and the Northeast, down 1%. In contrast, multifamily housing registered a 12% year-to-date decline, as it begins to retreat after seven straight years of growth. The nation’s leading multifamily market by dollar volume, New York NY, increased 1% year-to-date as it appears to have stabilized after registering a 28% decline for the full year 2016. Rounding out the top five multifamily markets in the January-November period, with their percent change from a year ago, were — Los Angeles, down 12%; Chicago, down 22%; Washington D.C., down 22%; and Atlanta, up 29%. Metropolitan areas ranked 6 through 10 were — Boston, down 32%; San Francisco, down 6%; Miami, down 48%; Seattle, down 16%; and Philadelphia, up 70%. Nonbuilding construction in November was $128.4 billion (annual rate), down 32% from the previous month. The public works categories as a group fell 34%, including a 49% plunge for the miscellaneous public works category that includes such diverse project types as pipelines, rail mass transit, and site work. October had included the start of the $3.0 billion expansion of the Atlantic Sunrise natural gas pipeline in Pennsylvania and Virginia, plus the $750 million Epic natural gas pipeline in Texas. November did include one substantial project, the $2.0 billion Purple Line Project, which is a 16-mile light rail line in Maryland extending from Bethesda to New Carrollton, but the other miscellaneous public works projects entered as November starts were considerably smaller in scale. Highway and bridge construction dropped 12% in November, retreating for the third month in a row following the improved activity reported in July and August. Additional public works declines in November were – sewer construction, down 6%; water supply construction, down 19%; and river/harbor development, down 64%. The electric utility/gas plant category in November receded 9%, although the latest month did include the start of several large power-related projects, including a $430 million wind farm in Nebraska, a $210 million natural gas-fired power plant in Massachusetts, and a $178 million transmission line project in Iowa. During the first eleven months of 2017, nonbuilding construction was down 7% from the same period a year ago. Much of the downward pull came from the 39% year-to-date decline for the electric utility/gas plant category, which continues to retreat from its exceptionally strong amount back in 2015. The public works categories as a group registered a 5% year-to-date gain. The miscellaneous public works category surged 29% year-to-date, boosted by a 73% jump for natural gas and petroleum pipelines to $20.2 billion and a 116% jump for rail mass transit to $9.5 billion. Highway and bridge construction edged up 1% year-to-date, stabilizing after the 9% decline reported for the full year 2016. The top five states ranked by the dollar amount of highway and bridge construction starts during the January-November period were — Texas, California, Florida, New York and Pennsylvania. Each of the environmental public works categories registered year-to-date declines — river/harbor development, down 10%; sewer construction, down 12%; and water supply construction, down 19%. The 1% increase for total construction starts at the national level during the first eleven months of 2017 was the result of a varied performance by geography. Year-to-date gains were reported in the Northeast, up 20%; and the South Atlantic, up 4%. The West held steady in the January-November period with last year’s corresponding amount. Year-to-date total construction declines were reported for the South Central, down 5%; and the Midwest, down 9%. For more info on Dodge Data and Analytics, just click this link.